On occasion, I damn the stove, and cannot muster enough energy to fire a burner to cook an egg. But this does not mean that I will not eat well. A little scrambling, and a visit to my favorite store, Milk and Honey Green Grocer in Salem, as well as a nice round of our favorite trash pantry game, and I'm in for another delicious dinner. Pretty balanced too. So today I stopped by Milk and Honey to grab something fruity and something tangy and maybe a bit of sliced meat. The first thing that caught my eye was a bit of goats milk cheese from Valley View Farm, a cute little log, speckled with dried herbs. The second thing was a sign near the register that said, deli meat: house roasted turkey breast. Sure, that'll do just fine. And now for fruit. Well, I have high hopes that maybe in the coming days we'll be going apple picking, since we are in full swing of the harvest now that the weather has turned. So, perhaps something other than the lovely apples I saw in the fruit case. They had a beautiful green bartlett pear. That will make for a slightly tart, crunchy element for the sandwich I plan to make. And yes, I'm planning on making a sandwich. So what to use for bread? As you know, I'm a big fat patron of the Dewey Square Farmers Market, and on occasion, I stop by the Swiss Bakers booth in order to pick up a soft pretzel, a pretzel stick, or a pretzel sandwich... maybe a butter animal here and there too. But a while back, I purchased a loaf of dark pajazzo bread. 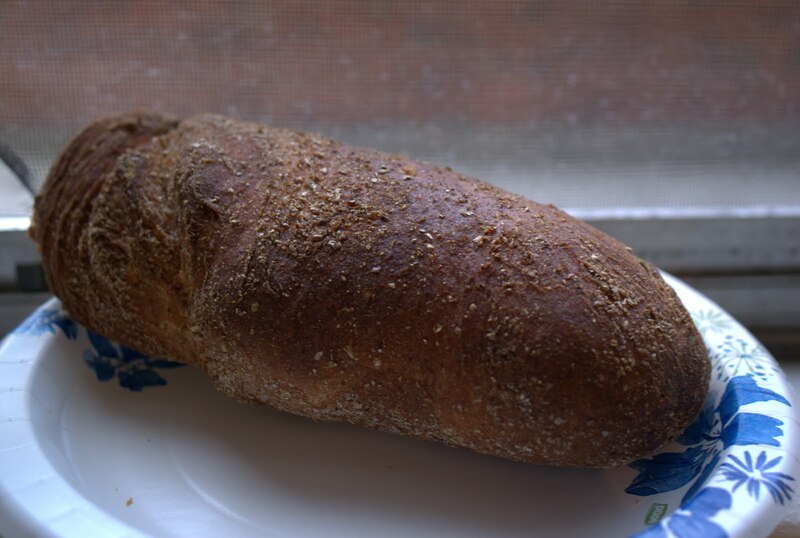 Pajazzo bread is a dark wheat bread, with a proper crust, and a nice earthy flavor. Since I didn't need the bread immediately, I froze it for an occasion such as this. Tonight, I broke it in half, turned the oven onto about 300 degrees, and popped my half in while it warmed up. After about five minutes, I sliced it in half and popped it back into the heat to toast up. Another five minutes and the inside was soft, and the outside had a nice little crust to it. 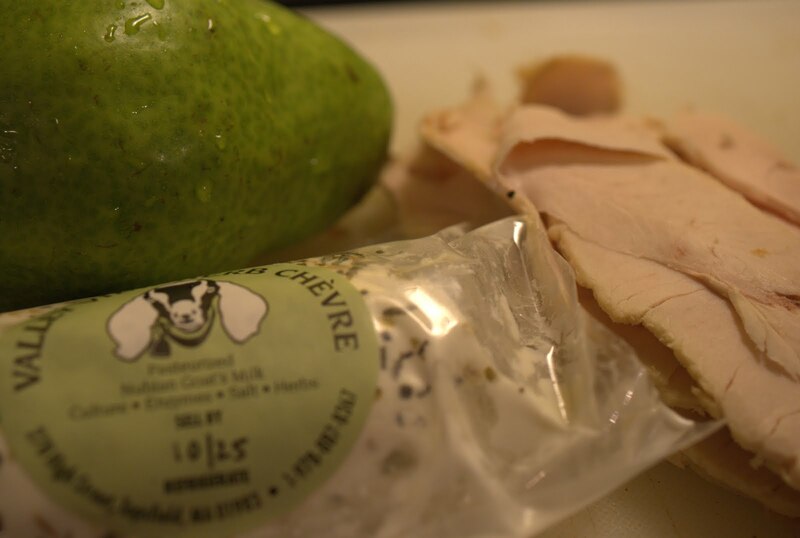 A swipe of mayo, a smear of that beautiful goat cheese, a layer of sliced pear, and and a generous amount of sliced turkey. It's far and beyond the simplicity of wonder bread, kraft cheese and deli turkey. You have the deep, earthy crunch of the pajazzo bread, and the creamy, luscious tang of the goats cheese. You also get a bit of crunch and sweet from the fresh slices of pear, and then the honest slices of home roasted turkey. What an amazing hearty sandwich for dinner.